The open spaces of Kualoa Ranch are popular sites for filming movies and TV shows. Finishing our Five-0 adventure, we visit the other side of the island. One of my favorite Five-0 places is on the opposite side of Oahu from Waikiki. 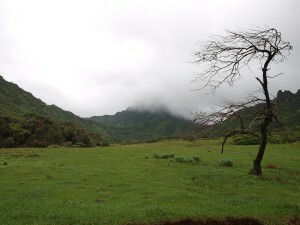 Kualoa Ranch on the windward side is a working cattle ranch, historic site and a popular movie and TV filming location. The very first scene in the Five-0 pilot is a flyover where you see a military convoy leaving a bunker. 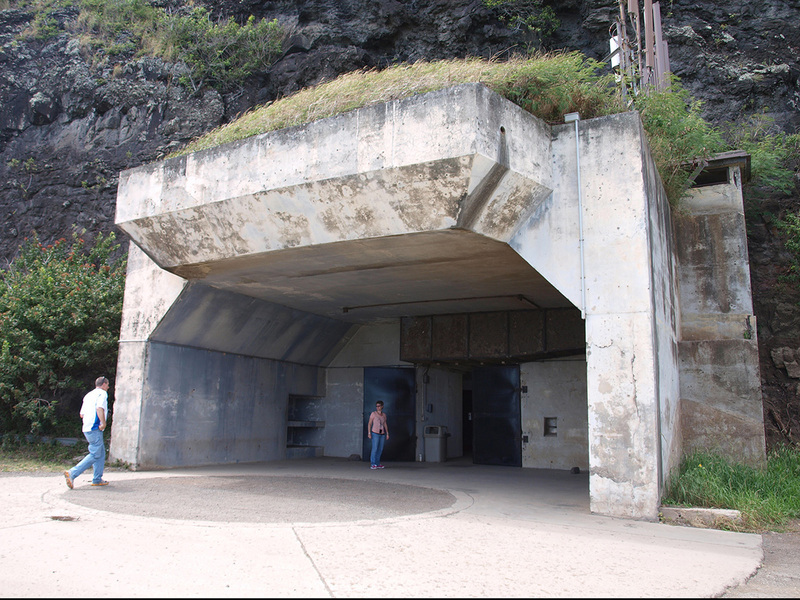 The first scene in the Five-0 pilot episode shows a military convoy leaving this bunker. The Movie Sites and Ranch Tour is my favorite of the activities at the Ranch. I’ve also been on the Jungle Expedition, which is a wild ride that charges up jungle trails in a six-wheel-drive vehicle, pauses briefly at the top of the mountains and then charges down again. Boy, does it bounce. Other Kualoa adventures include a horseback tour, an ATV tour and a catamaran voyage. I’ve taken half-day trips out there, but it wouldn’t be hard to spend a full day and even then you probably still couldn’t see everything. So, my advice is to pick something you love, do a little research and build a vacation around it. And it doesn’t hurt if what you love is based in beautiful Hawaii. 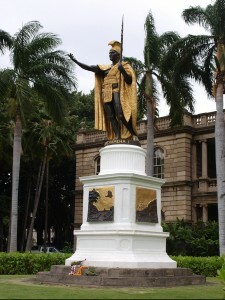 Away from Waikiki, there are more Five-0-related places to visit. 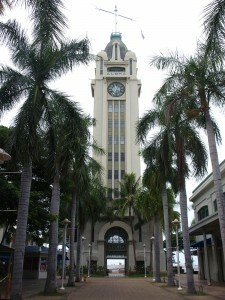 In downtown Honolulu, you can visit the Ali’iolani Hale, which is the building that stands in for Five-0 headquarters on the show. 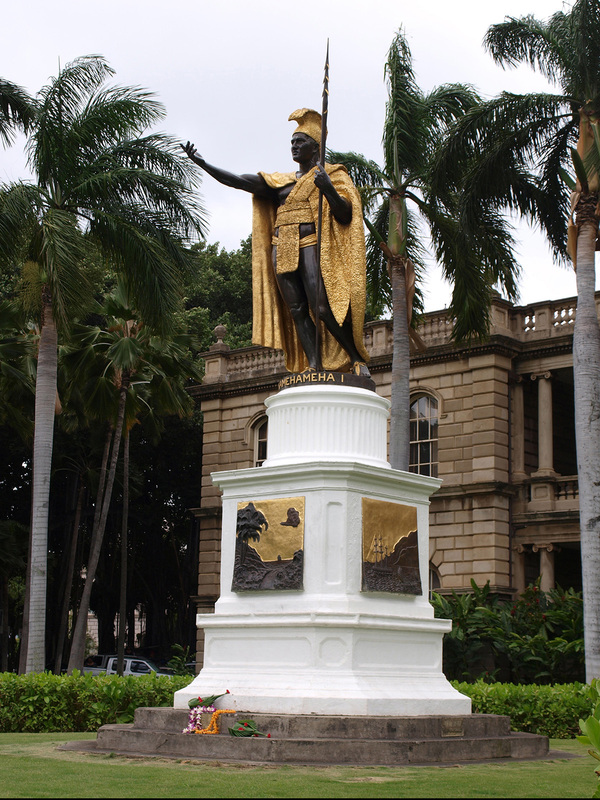 The famous statue of King Kamehameha stands in front of this court building at King and Punchbowl streets. You can go in the Ali’iolani Hale, but you’ll have to go through a metal detector because the building houses the Supreme Court of Hawaii, the court administration offices, a law library and the Judiciary History Center. 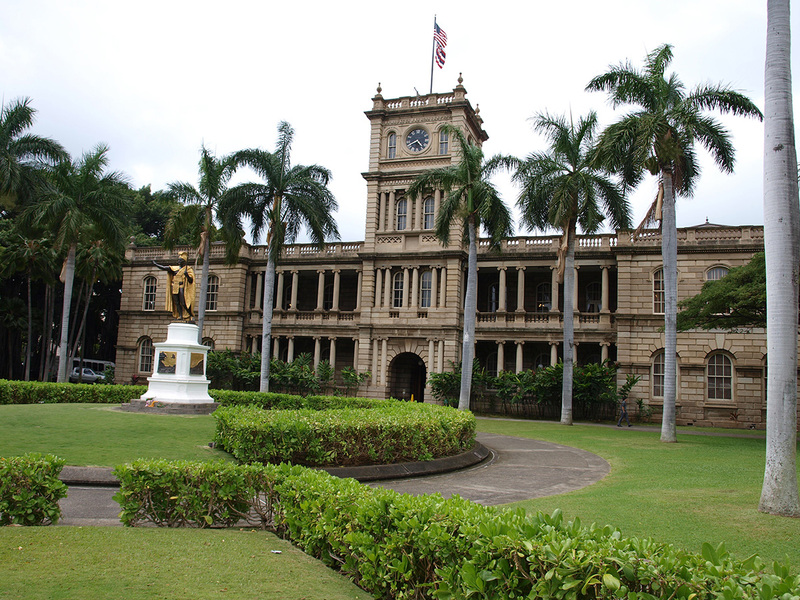 The Iolani Palace is across King Street, which was the headquarters in the original “Hawaii Five-0” series. It was a government building then. Now it’s a stunningly restored museum with the most gorgeous koa wood staircase, one of the first telephones on the islands and the quilt that Queen Liliuokalani embroidered while she was under house arrest by the people who overthrew the Hawaiian monarchy. Beautiful building, sad story. And if you want to see the Hawaii State Capitol, that’s one more block over, behind the palace grounds, facing Beretania Street. 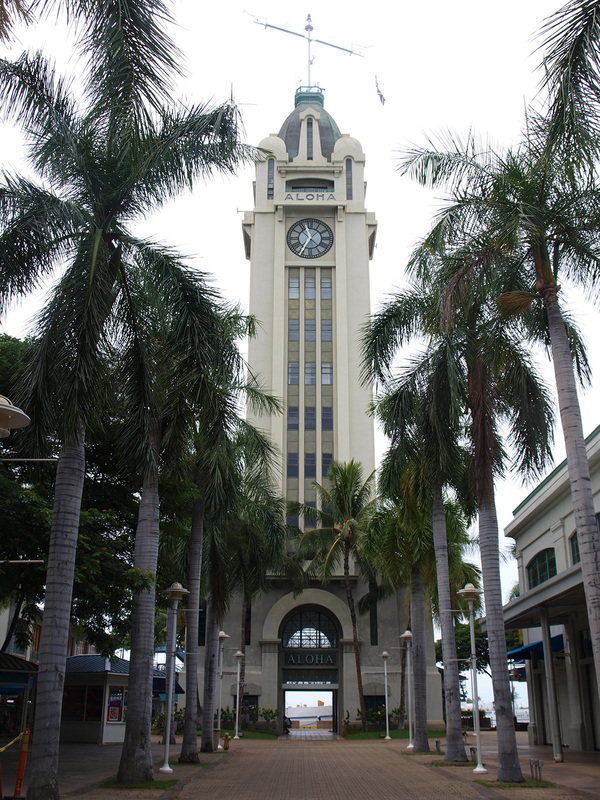 Make sure to visit the iconic Aloha Tower, a city landmark at the Honolulu waterfront, and the site of the International Market Place in Waikiki. Alas, Steve McGarrett (Alex O’Loughlin) will no longer race between the banyan tree trunks, knocking over carts in pursuit of bad guys. 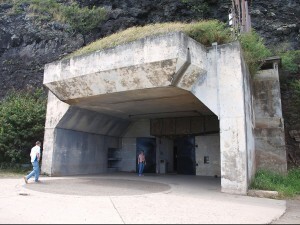 The longtime tourist attraction closed for redevelopment on New Year’s Eve. On a trip to Pearl Harbor, visit the USS Missouri, the battleship where the Japanese surrendered during World War II and where an entire Five-0 episode was set. The USS Arizona Memorial also was featured on an episode this season. I found it fascinating and moving to see representations of the start of World War II (for the U.S.) and the finish, virtually side by side in Pearl Harbor. 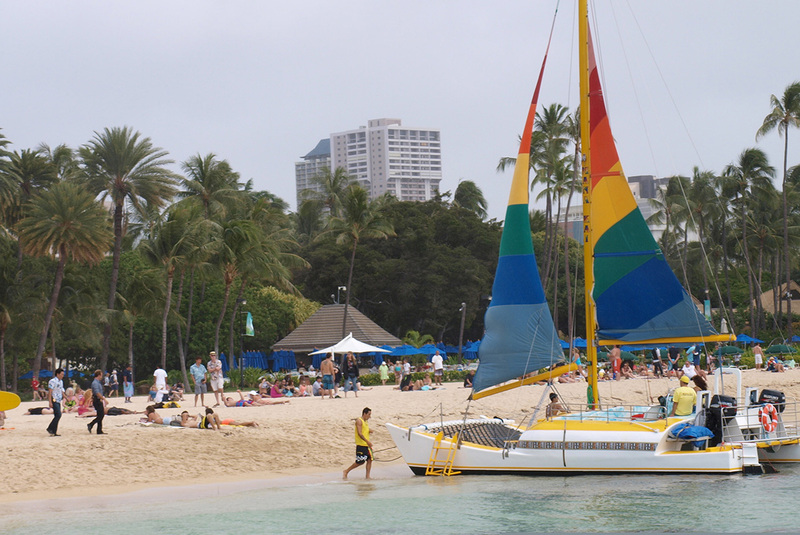 See Waikiki Beach during the boat ride out and tropical fish and sea turtles beneath the waves. Hope you don’t find a body like they did in season 1 of Five-0. 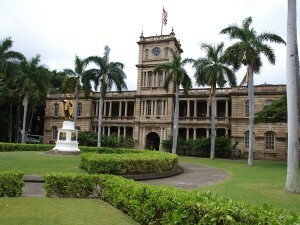 On my vacation on Oahu, I tracked the footsteps of Hawaii Five-0, looking for locations where the show has been filmed. I didn’t have to go far from the Hilton Hawaiian Village to find them. Out at the beach is a dock where you can catch a boat out to the Atlantis submarines (which appeared in a first-season episode of “Five-0”). The ride out is just as good as the sub ride, giving you a lovely view of Waikiki all the way to Diamond Head. 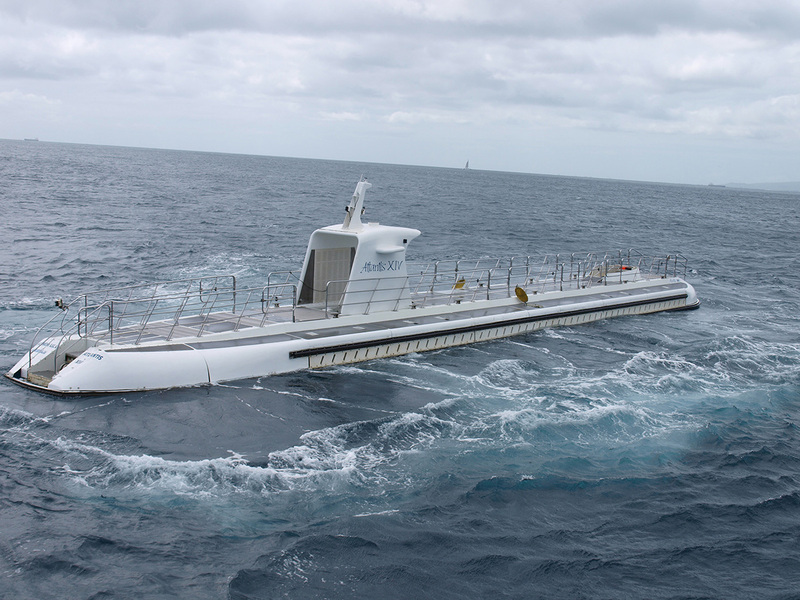 Then you take a dive in a real submarine to see colorful fish and sea turtles gathered around a couple of artificial reefs. 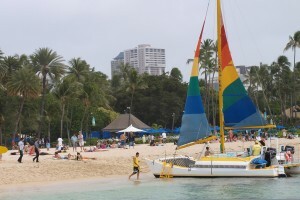 The Spirit of Aloha catamaran also sails from the dock, offering snorkeling and scuba cruises as well as evening trips with a dinner buffet and a view of the Hilton’s Tuesday and Friday night fireworks. Up on the roof of the Pacific Conference Center is the Waikiki Starlight Luau with a dinner buffet and terrific Polynesian music and dance. That’s just the tip of the shaved ice at the Hilton Hawaiian Village. There’s so much to see and do there, you hardly need to go anywhere else. And yet, it was just the beginning of my Five-0 adventure. View from the boat to the submarine shows a Five-0 set from season 2. Can you see Danny and Chin walking down to the beach at the far left? 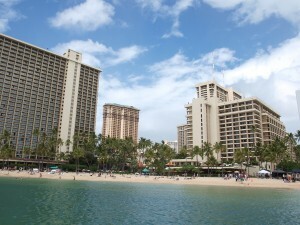 The Hilton Hawaiian Village was my hotel choice, because it is a production partner for the show. The cast and crew film there a lot. Sometimes it’s used as an anonymous beach, but the Five-0 team likes to celebrate at the Tropics Bar and Grill, and Danny and his daughter have gone swimming in the hotel’s Paradise Pool. I’ve done both of those. The Paradise Pool is the most fun of the resort’s five pools. It has water slides and a tunnel under a bridge and a hot tub. In the morning it even has shade, thanks to the hotel’s celebrated Rainbow Tower. The Tropics Bar is nice, with a patio right on the beach or inside seating if you’ve gotten overheated in the sun. The menu changes, but I’ve enjoyed the fish-and-chips and the lilikoi crepes there, and the Hawaiian staple, the loco moco — a hamburger served on rice covered with gravy and a fried egg on top. Don’t knock it till you try it. Oh, and I had to get a Hawaii Five-0 cocktail (a blue Hawaii with a swirl of strawberry puree). I like the Hilton. The people are nice, the rooms are clean and it’s so big. (This was very handy on the trip where bad weather made it hard to go anywhere else.) Other restaurants I liked were CJ’s Deli with New York-deli sandwiches and several kinds of eggs Benedict all day. The Rainbow Lanai has an enormous breakfast buffet and Lappert’s offers delicious ice cream and baked goods. The resort is aptly called a “Village” with six towers of guest rooms, a whole raft of stores in multiple shopping areas, two ABC stores for all the little things you forgot to pack. There’s also a store where you can buy “Hawaii Five-0” T-shirts and “Book ’Em, Danno” key rings.